We were inspired by this list of humorous, holiday-themed ICD-10 codes we found online and decided to figure out how many people were actually diagnosed with these codes. What did we find? A surprising number of trends. 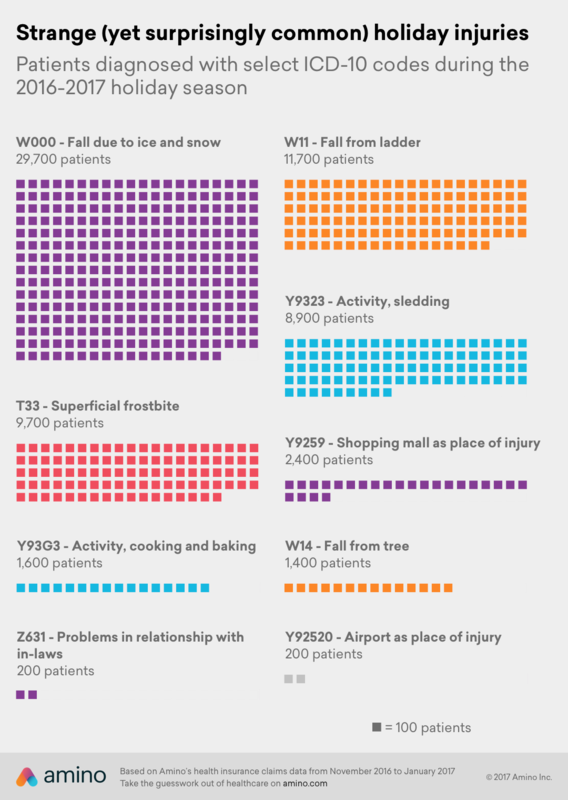 29,700 patients were diagnosed with “Fall due to ice and snow” as a cause of injury last holiday season. Walking and hiking are the most commonly associated activities with slipping on ice and snow—and the most commonly associated injuries were (unfortunately) all to the head: contusions, lacerations, and muscle strain to the neck and shoulder area. 9,700 patients were diagnosed with “Superficial frostbite” last holiday season. Superficial frostbite (the least severe version of frostbite) is quite common. We didn’t include more serious forms of frostbite, which can lead to permanent injury (numbness, affected joints or muscles, and losing all sensation in the affected area). 1,600 patients were diagnosed with “Activity, cooking and baking” as a cause of injury last holiday season. It’s difficult to tell from the codes alone if these diagnoses were a direct result of holiday-related activities—but for cooking and baking injuries, burns and cuts were the most common. 200 patients were diagnosed with “Problems in relationship with in-laws” as a cause of injury last holiday season. It looks like many of these patients were dealing with stress and anxiety. These types of symptoms are very common and not limited to folks who have terrible in-laws, however. 11,700 patients were diagnosed with “Fall from ladder” as a cause of injury last holiday season. We can’t say definitively what these people were doing when they fell from a ladder, but 11,700 people seems like a lot. 8,900 patients were diagnosed with “Activity, sledding” as a cause of injury last holiday season. Unfortunately, the most common injuries that resulted from sledding were concussions and other head injuries. 2,400 patients were diagnosed with “Shopping mall as place of injury” last holiday season. These were mostly minor injuries (like falls, cuts, and sprains). 1,400 patients were diagnosed with “Fall from tree” as a cause of injury last holiday season. Alas, the data doesn’t tell us what type of tree they fell from. 200 patients were diagnosed with “Airport as place of injury” last holiday season. Similar to shopping mall injuries, airport injuries also tended to be mundane (falls, cuts, sprains). While this season can be a busy time for all, it's important to be careful while doing all your holiday activities—whether that's cooking a big dinner, shopping for gifts, or going sledding with the family. Stay safe this holiday season!